The tourist area has the Daning River as its center and radiates into the surrounding area. The major scenic spots include the Lesser Three Gorges on the Daning River, the Least Three Gorges on the Madu River, the ancient town of Dachang, the site of the Daxi Culture, and the ruins of ape-man at Longgupo. It is in the town of Daxi, 45 kilometers west of Wushan County and 15 kilometers east of the Fengjie County seat. The Daxi Culture belonging to the primitive culture in the Changjiang River valley appeared 5,000 - 6,000 years ago when the later matriarchy was in its heyday and the early patriarchial society was in the bud. More than 1 ,250 historical relics have been brought to light, including stone axes, chisels in the shape of an elongated pointed jade tablet, pottery spinning wheels, and other production tools as well as earthenware, jade, and relief sculptures of human faces. 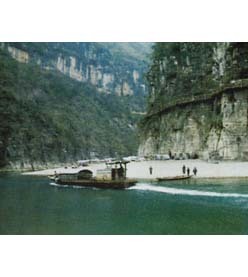 Chiselled into the face of cliffs, the plank road zigzags for more than 100 kilometers along the Daning River. No final conclusion has yet been reached as when the road was built and who built it. Archaeologists believe that it is from ancient times, and others hold that it was erected to support the pipeline for the transmission of salt solution because there is a rich salt mine on the upper reaches of the Daning River. 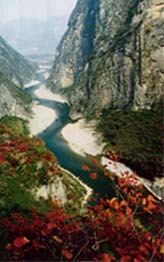 They are the Longmen, Bawu, and Dicui gorges on a 6,000-meter section of the Daning River, a tributary of the Changpang River, in Wushan County. Cliffs rise abruptly skyhigh on both sides and are covered with verdant plants. The gorges feature swift, crystal-clear water, enchanting peaks, and exotic rocks. One would be intoxicated with the green hills and blue water and have no time to take in all the scenes when riding a boat upstream.